In Canada, approximately 20,000 people are diagnosed annually with colon or rectal cancer, and cancer in these two related sites is the second leading cause of cancer deaths . A similar pattern is present in other jurisdictions around the world [2, 3]. Surgical removal of the appropriate bowel segment and attached lymphatic basin is the cornerstone of curative therapy. Unfortunately, many patients do not undergo such resections due to the presence of advanced unresectable disease or underlying patient comorbidities. Population-based data from Ontario, Canada (population 13 million) show that 18 % and 24 % of patients with colon and rectal cancer, respectively, do not undergo a resection of their tumor . Other data, also from Ontario, suggest that 10 % of patients undergoing resection of their primary colon or rectal tumor have stage IV or metastatic disease  (see Table 36.1). Rarely is stage IV disease curable. Patients who present with metastatic disease do not enter surveillance regimens, but may enter testing regimens that monitor response to therapy. One may estimate then that, in Ontario and likely in many other large populations, approximately 70 % of patients with colon or rectal cancer undergo resective surgery for cure. 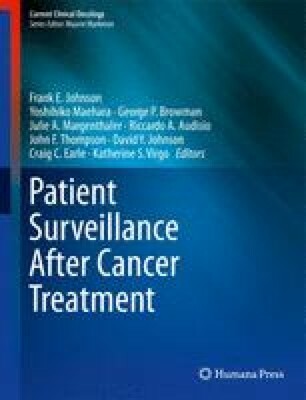 This chapter addresses surveillance for these patients. Canadian Cancer Society/National Cancer Institute of Canada: Canadian Cancer Statistics 2008, Toronto, Canada, 2008. ISSN 0835-2976. http://www.cancer.ca/canada-wide/about%20cancer/cancer%20statistics/∼/media/CCS/Canada%20wide/Files%20List/English%20files%20heading/pdf%20not%20in%20publications%20section/Canadian%20Cancer%20Society%20Statistics%20PDF%202008_614137951.ashx (Accessed November 19, 2009).